Retiring last July after 16 years with TaylorMade Golf, his most recent position being Executive Vice President of Product Creation, Sean Toulon says he gave retirement six whole days and then knew it wasn’t for him. Discussions with his sons resulted in the formation of Toulon Design a company that will make premium-priced milled putters. Priced starting at $400 they may not be for everybody but Toulon’s designs each have a pleasing esthetic feel and undeniable craftsmanship. We had the opportunity to ask Toulon some questions to find out his thoughts and philosophy about the hypercompetitive business he has entered. ET: Toulon Design putters are at the premium end of the putter market. Why did you choose this as an entry point? Toulon: When we decided to start a putter company we studied the market very hard. Like many other industries, this market has a lot of competitors. Most are very good. We want to be extraordinary. We obsess over creating the best performance putters in the world. We obsess over creating the most beautiful putters in the world. We decided that to create something special we had to obsess about using the best materials, the best construction techniques and create the greatest experience for the golfer. As you might imagine, that creates a higher price point. But that has never been our concern. Bar raising performance is. We practice what we call Performance Driven Design in everything we do. Toulon: Yes, in many ways it has. Maybe not as directly as one might expect, but past experience is always something you can draw upon. Zevo was a company involved in creating better performance for the golfer through a set of perfectly fitted clubs. Really about elevating personal performance through a great experience. Those are things that are important today at Toulon Design. ET: Your sons are working with you in Toulon Design. Was the opportunity to work with them a big reason to start the company? Toulon: Yes, a huge part of it – actually it was really their idea. Now all three of the boys are involved – Tony and Joe run the Marketing of the brand and are here full time. My youngest son Preston, works in the Arizona Diamondback organization but will be writing for us and managing our Toulon Design Digest newsletter. And BJ Taylor is running the operations of the company is like a fourth son – he’s been a friend of the boys and our family since grade school. It’s awesome to see them work and hear their thoughts. They have very different perspectives than I do and I think it’s fascinating to hear and implement things that I wouldn’t have seen or thought of. 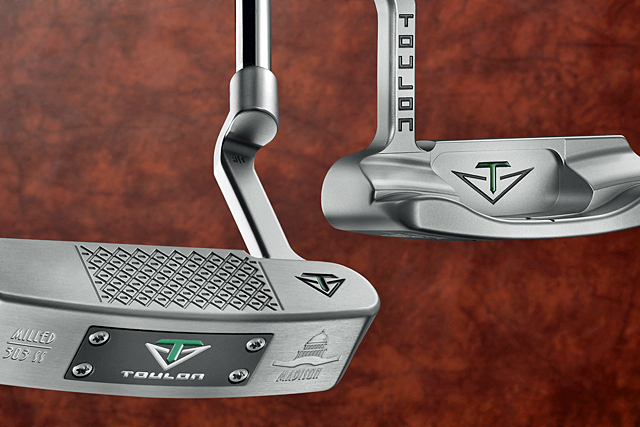 ET: One readily apparent feature separating Toulon Design putters is the milled pattern on the face. Why was that design was settled on? Toulon: To re-invent the performance of the putter we wanted to change the relationship of the way a putter sounds and feels in conjunction with how it rolls the ball. We wanted to make sure that what the golfer felt and heard at impact better matched up with the actual speed and the roll of the ball. Most putters in the marketplace don’t do this very well. We wanted our putter to feel a little softer and roll the ball better – settling into a nice controlled over spin and a tighter roll quicker. So we started looking at the face of the putter because that is where the collision of impact and ball occurs. We tested over 25 various mill patterns. About halfway through the process we became inspired by car tires and how the tread pattern channels water to create better traction. That changed the world to us. We knew that in order to make the putter feel softer to the golfer we had to make it sound more quiet. So we had to figure out a way to reduce the contact patch of the ball to the club face in a way to channel sound and improve the grip so we could improve the roll. Sound reacts the same way as water. So we started designing patterns that were heavily inspired by tire design. The one we ended with produces everything we wanted – and golfers absolutely love it. ET: The model lineup includes four blade-style heads and one face-balanced mallet, the Memphis, but all have the option of changing the sole plate to make the head heavier and adding a counterbalanced shaft. Have you made this an option because you see it as a way to help players effected by the USGA banning anchored putting stroke? Toulon: Yes that’s part of it – we believe that counterbalancing is an excellent alternative to anchoring as it helps a golfer release the putter head more aggressively. The more you add weight to the head and to the grip end of the club the more aggressively the putter wants to pass your hands. Also, having the ability to readily change the weight as dramatically as you can with a Toulon Design putter allows the golfer the ability to change the feel of his putter very easily. ET: You are using the expensive vacuum brazing technique to join the hosel and head, in effect making two pieces of metal into one. How does this help in creating the performance you want from your putters? Toulon: Customization is a big part of our Tour strategy. Vacuum Brazing allows us to build a wide variety of designs very quickly for tour players. As you might imagine, when a tour player is looking for a new putter they are like most golfers – they don’t want to wait! It also allows us two additional advantages. First we can build a lot of different designs to test – so it’s a great R&D enabler and finally when we launch our custom program in May, we will be able to offer the ability for any golfer to design and build their own design from our library of offerings – something that is very unique in the industry. ET: Does it help or hinder customization of putters for special orders? Toulon: It dramatically helps the ability to customize at a level not really readily available to the golfer today. ET: Speaking of special, the names of the models, Madison, Rochester, San Diego, San Francisco and Memphis are not the usual names for putters but what is the significance of using city names? Toulon: We wanted the names to mean something special – and these do – either to us specifically or to golfers around the world as places like Rochester and Memphis have unique (if somewhat less heralded) places in the game. ET: Toulon putters have burst onto the scene gathering lots of interest. Can you give us an idea of what the future holds? Toulon: We have been able to gain momentum quickly – and that’s been so much fun to see. The energy around Toulon Design is fantastic. I think it’s a tribute first to our product – we have created a special product that golfers just love. Secondly, the world today moves so fast – social and digital media allows a relevant message to erg tin front of a lot of people very quickly. We are going to launch on Tour next month, so we are looking to have our first opportunity to have a player win on the PGA Tour soon. Then in April we ship our first products into the Asian market where the anticipation for Toulon Design is also high. We look forward to a great golf season in 2016 and hope that everyone has a chance to play a lot of golf!